Argon i.MX6UL SOM Board is a very compact, micro sized, high performance board which is highly optimized for mobile Internet of Things applications. 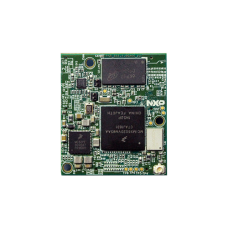 SOM Board is designed with i.MX 6Ultralite processor in a small form factor design. It integrates Wi-Fi +BT Combo module, Audio Codec and Power Management IC. It also has 3 Hirose 60 pin expansion connectors. Argon i.MX 6UL Development Platform offers a complete platform with large number of ready..